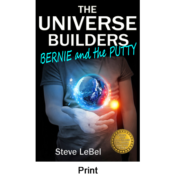 We just received notice that The Universe Builders: Bernie and the Putty has been declared the OUTSTANDING YOUNG ADULT NOVEL in the Independent Author Network Book of the Year Contest. The book was also entered into the Fantasy Category where it also did well, finishing as a FINALIST in that category. Needless to say, we’re delighted with this outcome. p.s. Because The Universe Builders won the OUTSTANDING YOUNG ADULT NOVEL, it is eligible for one of the top three awards (20015 Book of the Year – 1st, 2nd, and 3rd places). Click here to see how we did! This entry was posted in Book Awards & Honors, News. Bookmark the permalink.